I watched Mandy right after seeing Luca Guadagnino’s Suspiria, and during that film I was wondering where all the colour and vibrant atmosphere from Dario Argento’s original 1977 cult classic had gone to. Turns out, director Panos Cosmatos nabbed it and smeared it all over his new feature Mandy, a psychedelic and hypnotic punk-rock revenge thriller with a style all of its own, not to mention a warm welcome back to the kind of bonkers and manic Nicolas Cage performance that was hinted at earlier this year with Mom and Dad, but whereas that movie kind of kept him on the leash a bit, this one lets him off completely and has him charging all the way to something truly spectacular. It’s a very simple plot when you break it down; Cage is Red, a lowly logger who lives in a remote cabin somewhere in the Shadow Mountains in 1983, with his artist girlfriend Mandy (Andrea Riseborough). They live an idyllic and peaceful existence, until Mandy is spotted by vicious cult leader Jeremiah (Linus Roache) who leads his disciples to the cabin and attempts to brainwash Mandy, under the influence of LSD and wasp venom, into loving him. When that doesn’t work, they react in a way that leaves Red rattling for bloody vengeance – and boy howdy, does he begin to give these people their well-deserved comeuppance once he goes on the warpath. That’s the whole plot of the movie, by the way; no big twists halfway through, nothing that changes the game in any way shape or form, it’s just about this one guy getting his own back on the evil people that have wronged him. However, while it’s easy to dismiss this film for working with a generic formula that’s been done so often before in revenge movies, the style that Cosmatos goes all out with in this movie is something that cannot be rejected. It settles on a gory late 70s/early 80s exploitation movie vibe very early on, even before anything remotely violent happens, as the score by the late Jóhann Jóhannsson hints at a kind of heavy metal, Mötley Crüe-esque environment that’s as harsh and unforgiving as some of that band’s lyrics, and the breathtaking cinematography by Benjamin Loeb blankets it all in hellish red colours and moody blues that mix together to create imagery that anyone would see on a particularly bad drug trip. It harbours this style for the entire movie, and it’s fascinating to watch as things get more surreal yet the plot remains so simple and straightforward, which just goes to show that the execution is vital to breathing new life into a formula that’s been tried and tested over the years, something that Cosmatos manages to do with his insane vision for the thing. Nicolas Cage fans are bound to go totally bananas over this film, as after years of watching Cage in projects that disappointingly don’t call for him to go completely off-the-charts crazy like he used to do in films like Face/Off, Vampire’s Kiss, Bad Lieutenant: Port of Call New Orleans and many others, they will rejoice at finally seeing Nicolas Cage at his Nicolas Cage-iest in more ways than one. For the first half, he’s more of a side character whilst Andrea Riseborough’s Mandy takes up more screen time; but once the film reaches the half-way point, that’s when we start to see Cage going through all the motions we’ve wanted to see out of him for years, and it only gets crazier, and greater, from then onwards. His performance in this film is both haunting and extremely entertaining at the same time, as one moment you’ll be laughing at some of the big overblown wide-eyed Cage expressions that only he could perfect, as well as when he’s doing some very Nicolas Cage things like snapping a guy’s neck before taking a snort out of that guy’s mountain of cocaine, but the next moment you’ll be feeling sorry for the guy as you realise how wronged his character has been. It’s a great performance by an actor who’s loved in so many capacities by audiences of all kinds, and here he gets to do things that are so crazy and over-the-top, even for someone like Nicolas Cage; he gets to make and wield a giant metal axe at people’s heads, goes into battle holding a crossbow, and if that wasn’t awesome enough, he actually engages in a swordfight between two fully-functioning chainsaws. My description of things that happen in this movie seriously do not do them any kind of justice; you’ve got to see the absolute insanity for yourself, as that way you’ll be absolutely blown away by how ridiculously awe-inspiring he can be in this film, especially in one later kill that’s as gory as it is incredibly satisfying. 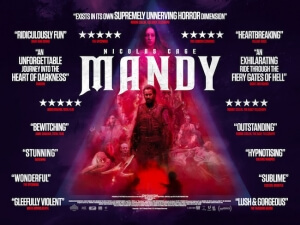 Mandy is the kind of movie-going experience that Luca Guadagnino’s Suspiria was aiming for, only I found this film to be more visually interesting and simplistic, whereas I couldn’t tell you what happened in Suspiria even if I tried. It’s also got one hell of a fierce performance by Nicolas Cage, who you really want to see just give these evil cultists, led by a sinister and creepy Linus Roache, as well as the weird demonic biker gang they use to hunt Mandy down, a piece of their mind, figuratively and sometimes all too literally. It’s got a beautiful style to it, with every shot feeling like it could easily grace the cover of every heavy metal album ever, and told with such precision and artistic integrity by Cosmatos that you immediately want to see what other kind of mad visuals he has lying about in his skull. It’s a gory but fun throwback to exploitation movies of an era long since gone, and a welcome return to the Nicolas Cage we all know and love. Mandy is a gory and incredibly stylish throwback to explotation revenge movies of the 70s and 80s, with gorgeous and colourful cinematography perfectly complimenting the absolutely insane visuals, and features Nicolas Cage giving one of his greatest and most glorious over-the-top performances in years.